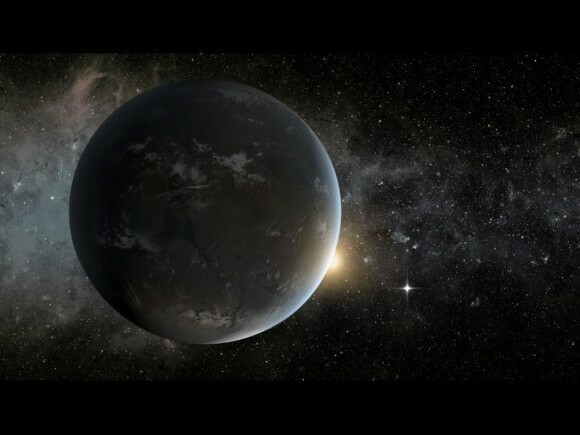 The Kepler mission has discovered two new planetary systems that include three super-Earth-size planets in the “habitable zone,” the range of distance from a star where the surface temperature of an orbiting planet might be suitable for liquid water. The new planets brings the number of confirmed exoplanets to 861. 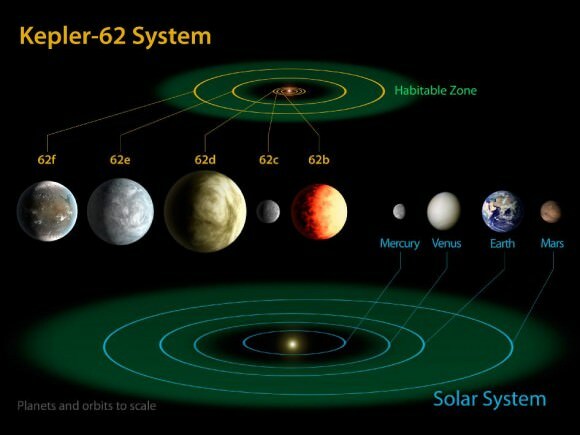 According to the Planetary Habitability Laboratory, there are now nine potential habitable worlds outside of our solar system, with 18 more potentally habitable planetary candidates found by Kepler waiting to be confirmed. Additionally, astronomers predict there are 25 potentially habitable exomoons. The diagram compares the planets of the inner solar system to Kepler-69, a two-planet system about 2,700 light-years from Earth. Current known potentially habitable exoplanets. Credit: Planetary Habitability Laboratory/University of Puerto Rico, Arecibo. Current potentially habitable exoplanets showing the new additions, Kepler-62e and Kepler-62f. Credit: Planetary Habitability Laboratory/University of Puerto Rico, Arecibo. Comparison of the orbit and size of the exoplanets of Kepler-62 with the terrestrial planets of our Solar Systems. The darker green shaded area corresponds to the ‘conservative habitable zone’ while its lighter borders to its ‘optimistic habitable zone’ extension. Planet sizes and orbits are not to scale between them. Credit: Planetary Habitability Laboratory/University of Puerto Rico, Arecibo. This is good, since they retired Tau Ceti f due to the redefinition of the habitable zone this will get us back up to ~ 50 % of stars with known habitables having 2 of them. Mars was surface habitable once, so should count as regards potential. I suspect most systems will have 2 habitables, making us a bit underwhelming as regards biospheres. Oh, well. Speaking of Mars, another Mars sized Kepler planet. IIRC there are 2 of them, certifying that Kepler can see them for sure. Would you be able to describe what Earths climate (say preindustrial) would be like if it was in a Mars-orbit? Would the oceans freeze? Thanks. Earth would have a much slower carbon cycle due to slower silicate weathering, so CO2 will not be removed from the atmosphere so efficiently as is here. CO2 will then accumulate to make a dense CO2-dominated atmosphere that will, with the greenhouse effect, prevent it from becoming a frozen iceball. You could emit any CO2 there without severely impacting the climate, because the greenhouse effect , unlike here, would be almost saturated. I suspect (but I am no expert) that if you emit a lot of CO2 in a paleo-Venus that barely offset the H2O greenhouse effect (dominated by H2O there due to being so near the Sun that oceans strongly evaporate under warm temperatures) by almost removing all CO2 thanks to a silicate weathering on steroids, then things will instead turn very nasty. Cambria era or any period of earths time, for except our time of today. I am not a student of. But you choose a great name ;-)… . Maybe I’ll choose my next name of the “bombardment period” of earths time. Must of been a great sight to see! All that pounding of incoming comets & asteroids splashing/hitting the molten lava earth must of been so great to see. I find that super_earth has done my work for me, and splendidly too! The short answer now when the greenhouse effects have been described is that Earth is large and “greenhouse” enough* so the habitable zone of Kasting means “habitable” for a decent time, while Mars was habitable for a short time. * When you get further out, Earth’s conditions wouldn’t suffice, and you would want to have larger planets with more massive atmospheres. Do you think also that Venus could actually be INSIDE in the habitable zone, but got an extreme “greenhouse fever” some billion years ago? I am right that Venus-like planets (planets almost identical to Earth but nearer to the star) are potentially habitable, but very vulnerable to runaway global warming? Is a Venus-like scenario possible on Earth if there is an extreme global warming event (like the aftermath of a “snowball earth” glaciation, or the warming resulting from burning of almost all fossil carbon in a few decades or centuries) or, thanks to our active plate tectonics and extensive continents and oceans, the silicate weathering feedback will capture CO2 as carbonates before triggering a runaway greenhouse? I never really gave this too much thought. But off the cuff. Lets say there is a prototype earth in the habitable zone, w/a liquid iron core, w/H2O seas, & the usual etc’s.. . Wouldn’t that earth like planet need a moon to be free from the wide swings?? I would say common sense would say yes for the ‘most’ part would be a ‘yes’. It would need the stability on its axis & the wide swings of the tidal forces & etc’s.. . Another words. Wide weather, seas & ice ages galore. ..take care. The planet would also need plate tectonics to keep the entire surface of the planet from melting, like it does on Venus every 500 million years. Yes, plate tectonics helps build an oxygenated atmosphere and Earth is marginal. Hence I would expect planets that have the most productive surface biospheres to be larger, with Earth at the tail end. I don’t think we know that Venus has global remelting episodes? Last I was conversant with the field, the existence of extensive tesserae (presumably older) terrain meant it wasn’t all replaced at once. I find myself unable to ground an analysis in unsubstantiated “belief”, I need to use substantiated trust in relevant uncertainty measures aka groundings for facts (or lack thereof). That said, this was resolved last year IIRC, and the trustworthy response was “likely not”. Earlier simulations that shows chaotic changes in orbital axis and hence periodical disruptions in climate had made a mistake. The timescales are such that there are long periods of stable climate of 0.5 billion years, more than enough to evolve not only bipedal apes but animals with body plans. Ok thanks Tor. This came from 1 of my students although I typed his question. They seem to gravitate towards you w/your scientific knowledge. I personally doubt we will know until we see this for ourselves. But who knows, Webb could come to ‘see’ a verifiable conclusion. Thanks for the reply ;-)… …take care. Mars has evidence of past liquid water in its surface. Yes. The question is Venus lost its water before or after life could develop.